Podocarpus (/ˌpoʊdəˈkɑːrpəs/) is a genus of conifers, the most numerous and widely distributed of the podocarp family, Podocarpaceae. Podocarpus are evergreenshrubs or trees, usually from 1 to 25 metres (3 to 82 ft) tall, known to reach 40 metres (130 ft) at times. The cones have two to five fused cone scales which form a fleshy, berry-like, brightly coloured receptacle at maturity. The fleshy cones attract birds which then eat the cones and disperse the seeds in their droppings. There are approximately 97 to 107 species in the genus depending on the circumscription of the species. 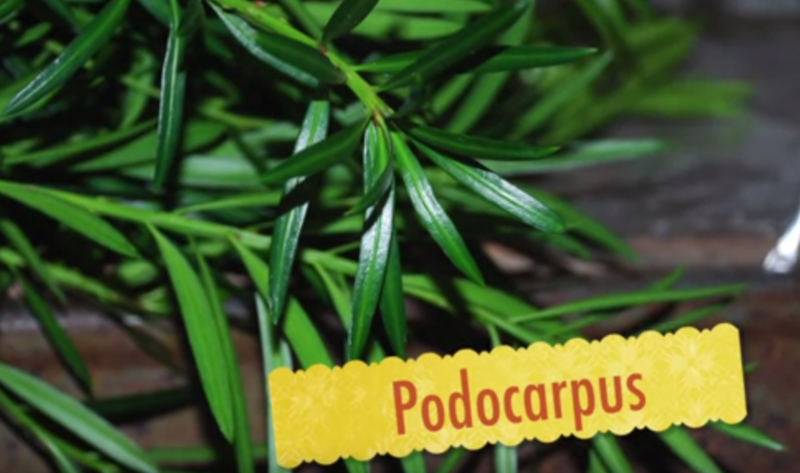 Podocarpus are evergreen woody plants. They are generally trees but may also be shrubs. The trees can reach a height of 40 meters at their tallest. Some shrubby species have a decumbent growth habit. The primary branches form pseudo-whorls around the trunk. The bark can be scaly or fibrous and peeling with vertical strips. Terminal buds are distinctive with bud scales that are often imbricate and can be spreading. The leaves are simple, flattened and may be sessile or short petiolate. The phyllotaxis or leaf arrangement is spiral and may be subopposite on some shoots. The leaves are usually linear-lanceolate or linear-elliptic in shape, though they can be broader lanceolate, ovate or nearly elliptic in some species. Juvenile leaves are often larger than adult leaves though similar in shape. The leaves are coriaceous and have a distinct midrib. The stomata are usually restricted to the abaxial or underside of the leaf, forming two stomatal bands around the midrib. Podocarpus are generally dioecious, with the male pollen cones and female seed cones borne on separate individual plants but some species may be monoecious. The cones develop from axillary buds and may be solitary or form clusters.